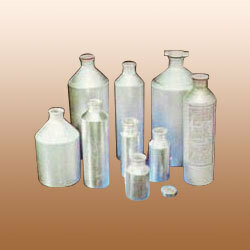 Leading Manufacturer of aluminum water bottles from Bengaluru. We are able to manufacture and export a huge range of Aluminum Water Bottles that are widely used in the packaging of liquids. Fabricated from high grade raw materials, our range complies with varied quality standards. We customized our collection on the basis of specific requirements of our clients. These are widely accepted by our clients for its durability, corrosion resistance and longer functional life. Looking for Aluminum Bottle with Screw Plug ?